TSKgel PW columns are composed of spherical, hydrophilic polymethacrylate beads. Particle sizes range from 12 µm for the smaller pore size columns to 17 µm for the larger pore size columns. The main application areas for TSKgel PW columns are the analysis of water-soluble polymers, such as celluloses, acrylamides, glycols, dextrans, polyvinylalcohol, and oligosaccharides. 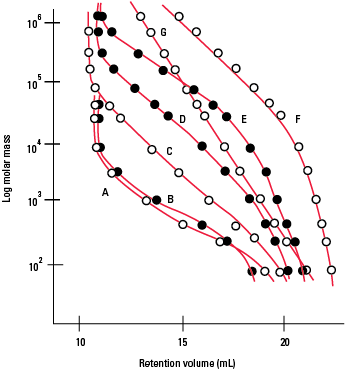 The figure below shows the calibration curves for all TSKgel PW columns. Suitable solvents for various polymer samples are shown in the table below. The TSKgel GMPW column is a mixed bed column containing a mixture of different pore sizes that has an extended linear calibration range, suitable for samples with a broad molar mass (MM) distribution, as well as unknown samples. A TSKgel G6000PW column is available in PEEK hardware, TSKgel BioAssist G6PW, when ultra-low sample adsorption is required, such as in virus analysis.